"I must say this is the 1st time I've really e-mailed you guys and WOW are you ever quick. Thank-you very much, Omaha Indicator is an excellent tool and I appreciate your hard work and dedication! :) Take care. " "Thank you very much for your excellent program and first of all, your fantastic quick response on mail and positive and excellent service. Again an excellent tool and would be lost without it! I promise you that because of this service, I will recommend this program to all my pokerfriends!!! " By downloading, you agree to our License Agreement. Apr 10, 2019 - version 2.4.2 released. Patch for Ignition Poker, Bodog Poker. Make sure you launch Omaha Indicator before you open your poker client. Oct 19, 2018 - version 2.4.1 released. Patch for Winamax. Jul 24, 2018 - version 2.4.0 released. Patch for PokerStars/Full Tilt. May 31, 2018 - version 2.3.9 released. Patch for Svenska Spel Poker. May 24, 2018 - version 2.3.8 released. Patch for PokerStars. Apr 27, 2018 - version 2.3.7 released. Patch for Chico/Betonline Poker. Apr 26, 2018 - version 2.3.6 released. Patch for PokerStars and Microgaming sites. Apr 12, 2018 - version 2.3.5 released. Patch for Chico/Betonline Poker. Feb 23, 2018 - version 2.3.4 released. Patch for Party Poker. Jan 13, 2018 - version 2.3.3 released. Patch for Chico/Betonline Poker. Nov 23, 2017 - version 2.3.0 released. Fixed the freeze/crash issue with Ignition Poker, Bodog Poker and Bovada. Oct 17, 2017 - version 2.2.9 released. Patch for GG Network (AllNewPoker, Natural8, etc). Sep 7, 2017 - version 2.2.8 released. Patch for PokerStars & Full Tilt. Aug 18, 2017 - version 2.2.6 released. Patch for Ignition Poker, Bodog Poker. Jun 29, 2017 - version 2.2.5 released. Patch for Unibet & Juicy Stakes. May 31, 2017 - version 2.2.4 released. Patch for Chico/Betonline Poker. May 24, 2017 - version 2.2.3 released. Supports the Jackpot & SnG 2.0 games on Americas Cardroom, WPN sites. May 5, 2017 - version 2.2.2 released. Patch for Microgaming MPN sites. Feb 7, 2017 - version 2.2.1 released. Patch for PokerStars & Full Tilt. Jan 19, 2017 - version 2.2.0 released. Supports the new Unibet Poker. Sep 23, 2016 - version 2.1.9 released. Patch for Chico/Betonline Poker and 888 Poker. Sep 23, 2016 - version 2.1.7 released. Patch for GG Network (AllNewPoker, AsyaPoker, etc). Aug 03, 2016 - version 2.1.4 released. Patch for Chico/Betonline Poker; Supports new site GG Network (AllNewPoker, AsyaPoker, etc); Supports new site Europe-bet/Pokerdom. Due to technical reason, make sure you open the first Omaha Indicator before you launch your BetOnline poker client. Jun 1, 2016 - version 2.1.3 released. Supports new site Fulpot Poker (English version only). May 16, 2016 - version 2.1.2 released. Patch for the new PKR software. Due to technical reason, make sure you already have one Omaha Indicator works with the existing PKR game table before you open a new one. Apr 14, 2016 - version 2.1.0 released. Patch for 888 Poker, PokerStars, Party Poker. Mar 24, 2016 - version 2.0.9 released. Patch for Winamax. Mar 09, 2016 - version 2.0.8 released. Patch for the new PKR software. Due to technical reason, make sure you already have one Omaha Indicator works with the existing PKR game table before you open a new one. Feb 27, 2016 - version 2.0.7 released. Bug fixes and improvements. Jan 28, 2016 - version 2.0.6 released. Patch for Party Poker. Jan 11, 2016 - version 2.0.5 released. Patch for Patch for Ignition Poker, Bodog Poker. Nov 3, 2015 - version 2.0.2 released. Patch for the new iPoker clients and Winamax. Oct 14, 2015 - version 2.0.1 released. Patch for Winamax and Unibet Poker. Sep 25, 2015 - version 2.0.0 released. Improvements to meet the 3rd party software requirements of PokerStars and Full Tilt. 1. Don't show "Group" for starting hands. 2. Don't show player profiling icons on HUD. This is for PokerStars and Full Tilt only. Aug 28, 2015 - version 1.9.9 released. Patch for PKR and PokerStars ZOOM games. Jun 30, 2015 - version 1.9.8 released. Patch for Unibet Poker. Jun 11, 2015 - version 1.9.7 released. Patch for Full Tilt. May 1, 2015 - version 1.9.5 released. Patch for PokerStars. Dec 21, 2014 - version 1.9.4 released. Patch for Revolution Gaming(Cake) Network. Dec 16, 2014 - version 1.9.3 released. Adds new feature - Stats Graphs. You can review your sessions with graphs. Nov 3, 2014 - version 1.9.2 released. Patch for PokerStars. Oct 1, 2014 - version 1.9.0 released. Patch for Winamax. Jul 22, 2014 - version 1.8.8 released. Patch for 888 Poker, WSOP. Jun 20, 2014 - version 1.8.7 released. Patch for PokerStars. May 27, 2014 - version 1.8.6 released. Patch for Bovada/Bodog. Mar 14, 2014 - version 1.8.5 released. Patch for PokerStars. Jan 27, 2014 - version 1.8.4 released. Patch for iPoker sites(Titan Poker, etc). Dec 03, 2013 - version 1.8.3 released. Patch for PokerStars, Betonline Poker and Ongame Network. Oct 15, 2013 - version 1.8.1 released. Patch for Merge Gaming sites. Jul 17, 2013 - version 1.8.0 released. Patch for Full Tilt. Feb 08, 2013 - version 1.7.9 released. Patch for Full Tilt. Jan 22, 2013 - version 1.7.8 released. Patch for Merge Gaming sites. Oct 19, 2012 - version 1.7.7 released. Patch for PokerStars. Jul 17, 2012 - version 1.7.6 released. Patch for PokerStars. Jun 14, 2012 - version 1.7.5 released. Patch for PKR. Jun 06, 2012 - version 1.7.4 released. Patch for Merge Gaming sites. May 31, 2012 - version 1.7.3 released. Patch for 888 Poker. May 16, 2012 - version 1.7.2 released. Supports Winning Poker Network (Americas Cardroom, True Poker, and other skins). Omaha Indicator is the first online Poker Odds Calculator that supports this online poker network. May 04, 2012 - version 1.7.1 released. Supports Cake Poker version 2.0 and skins. Patch for 888. Omaha Indicator is the only online Poker Calculator that supports new Cake software. Mar 26, 2012 - version 1.7.0 released. Patch for Bovada/Bodog. Mar 23, 2012 - version 1.6.9 released. Supports the new Zoom games on PokerStars. Mar 16, 2012 - version 1.6.8 released. Patch for PokerStars. Mar 08, 2012 - version 1.6.7 released. Supports Sky Poker. Patch for Ongame Network (RedKings, Betfair, etc). Omaha Indicator is the first online Poker Calculator that supports Sky Poker. Jan 09, 2012 - version 1.6.6 released. Patch for PokerStars. Dec 09, 2011 - version 1.6.5 released. Patch for Bodog. Oct 18, 2011 - version 1.6.4 released. Patch for PokerStars. Sep 28, 2011 - version 1.6.3 released. Patch for PKR. Aug 09, 2011 - version 1.6.1 released. Patch for Everleaf network. Jul 01, 2011 - version 1.6.0 released. Patch for PKR. Jun 14, 2011 - version 1.5.9 released. Patch for Ongame Network (RedKings, Betfair, etc). Jun 09, 2011 - version 1.5.8 released. Patch for PokerStars. Jun 03, 2011 - version 1.5.7 released. Patch for Ongame Network (RedKings, Betfair, etc). May 24, 2011 - version 1.5.6 released. Patch for Boss Media sites. May 12, 2011 - version 1.5.5 released. 1. Patch for PokerStars. 2. Added new functionality - Hand Replayer. You can visualize hands you played with the exact player stats and win odds (for yourself and players with known cards). May 01, 2011 - version 1.5.4 released. Patch for Entraction Network. Apr 26, 2011 - version 1.5.3 released. Calculateur de cotes de poker Winamax.fr (Support for Winamax.fr). Jan 11, 2011 - version 1.5.2 released. Patch for Full Tilt. Dec 14, 2010 - version 1.5.1 released. Patch for Bodog Poker. Dec 06, 2010 - version 1.5.0 released. Patch for Merge Gaming Network(Sportsbook, etc). Nov 24, 2010 - version 1.4.9 released. Patch for PKR. Nov 19, 2010 - version 1.4.8 released. Patch for PokerStars.FR. Oct 07, 2010 - version 1.4.7 released. Patch for PKR and Everest Poker. Oct 07, 2010 - version 1.4.6 released. HUD supports Bodog(not available for multi-table tournaments). Sep 28, 2010 - version 1.4.5 released. Patch for Bodog Poker. Sep 24, 2010 - version 1.4.4 released. Patch for PKR and 888 Poker. Sep 22, 2010 - version 1.4.3 released. Performance improvement for HUD. Sep 10, 2010 - version 1.4.1 released. Bug fixings. Aug 19, 2010 - version 1.4.0 released. 1. Added feature to auto-launch Holdem Indicator for new game tables. 2. Color-coded text for HUD stats. Aug 05, 2010 - version 1.3.9 released. Patch release for Party Poker. Aug 03, 2010 - version 1.3.8 released. Patch release for PKR. Jul 29, 2010 - version 1.3.7 released. Patch release for the new Betfair Poker client. Jul 06, 2010 - version 1.3.6 released. Added Head-Up Display (HUD) for Omaha Indicator. Apr 21, 2010 - version 1.3.4 released. Patch release for Full Tilt. Apr 16, 2010 - version 1.3.3 released. Patch release for Full Tilt. Feb 09, 2010 - version 1.3.2 released. Full stats support for Rush Poker on Full Tilt. Stats will be collected even if you fold before a hand is finished. Patch release for Ongame network. Feb 05, 2010 - version 1.3.1 released. Bug fixings and improvement for Full Tilt. Dec 09, 2009 - version 1.3.0 released. Patch release for Betfair. Dec 04, 2009 - version 1.2.9 released. Added more stats: 3 Bet%, Fold to 3 Bet %; CBet%, Fold to CBet %; Steal Attempt %, Fold to Steal %. Oct 28, 2009 - version 1.2.8 released. Patch release for 888 Poker. Oct 15, 2009 - version 1.2.7 released. Patch release for Full Tilt Poker. Sept 24, 2009 - version 1.2.6 released. Supports Betfair site. Aug 31, 2009 - version 1.2.5 released. Supports Entraction Network (24hPoker.com, etc ). Aug 17, 2009 - version 1.2.4 released. Supports Bodog Poker. Jul 30, 2009 - version 1.2.3 released. Patch release for Full Tilt Poker. Jul 22, 2009 - version 1.2.2 released. Patch release for CEREUS Network(UltimateBet, Absolute Poker, etc). Jul 08, 2009 - version 1.2.1 released. Patch release for Full Tilt Poker. Jul 08, 2009 - version 1.2.0 released. Patch release for Full Tilt Poker. Jul 02, 2009 - version 1.1.9 released. Patch release for PokerStars. Jun 19, 2009 - version 1.1.8 released. Patch release for Ongame Network(BWin etc). Jun 17, 2009 - version 1.1.7 released. Patch release for 3D poker site PKR. Jun 04, 2009 - version 1.1.6 released. Patch release for CEREUS Network(UltimateBet, Absolute Poker, etc). May 08, 2009 - version 1.1.5 released. Patch release for Cake Poker Network (Sportsbook Poker, etc). Added Stats Window to the "Vertical View". Apr 23, 2009 - version 1.1.4 released. Added "Vertical View" feature. Click "Views" > "Vertical View" on your Omaha Indicator. Mar 09, 2009 - version 1.1.3 released. Patch release for PokerStars. Feb 26, 2009 - version 1.1.2 released. Patch release for CEREUS Network(UltimateBet, Absolute Poker, etc). Feb 13, 2009 - version 1.1.1 released. Patch release for iPoker Network(Titan Poker, CD Poker, etc). Jan 23, 2009 - version 1.1.0 released. Bug fixings and improvement for Everest Poker, CEREUS Network(UltimateBet, Absolute Poker, etc) and Merge Gaming Network(Carbon Poker, etc). Jan 17, 2009 - version 1.0.9 released. Supports 3D poker site PKR. We also added Manual Calculator to this version. Dec 15, 2008 - version 1.0.8 released. Supports new site Everest Poker. Dec 12, 2008 - version 1.0.7 released. Patch release for PokerStars. Nov 16, 2008 - version 1.0.6 released. Patch release for Ongame/PokerRoom Network. Nov 07, 2008 - version 1.0.5 released. Patch release for Party Poker. Oct 14, 2008 - version 1.0.4 released. Patch release for Full Tilt Poker. Oct 12, 2008 - version 1.0.3 released. Supports UltimateBet Poker. Sept 24, 2008 - version 1.0.1 released. Patch release for Party Poker. Aug 22, 2008 - Omaha Indicator Poker Calculator version 1.0.0 released. 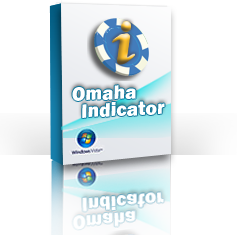 Omaha Indicator is the ultimate Poker Odds Calculator for online Omaha game play.